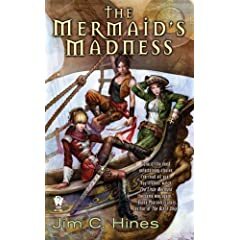 As requested, here is your more-or-less official discussion thread for The Mermaid’s Madness [Amazon | Mysterious Galaxy]. Because my blog mirrors to different places, I’d suggest going either to LiveJournal or http://www.jimchines.com/2009/10/mermaid-discussion-post/ for the liveliest discussion. If you haven’t read the book and don’t want to know what happens, stay the heck out of the comments. Otherwise, all discussion, speculation, and questions* are welcome. *I might even answer some of ’em! « Ooh, Awkward…	» Why Doesn’t She Leave? I met you at the Fantasy Writer’s event at the Delta Township District Library. Just wanted to say I loved The Mermaid’s Madness, and the interested twist you spun on the original fairy tale! I especially loved how we got more of Talia’s backstory. So Snow finally knows how she feels, huh? I have a feeling that they aren’t going to get together, but where does that leave Talia? And this might be a weird question, but is Talia only attracted to women–as a result of what happened to her–or will is she just attracted to the person, regardless of gender? Because it would be kind of interesting if she hooked up with Gustan’s brother. I loved how the sword turned out to be a “suitor’s gift”. LOL! Either way, I hope she has a better love life in the next few books. I do consider Talia to be a lesbian, not because of what was done to her, but simply because that’s who she is. Talia and Varisto do have a lot in common, and in other circumstances I could see the potential for them to be a good couple.